Swyre a village on the B3157 from Bridport to Weymouth in Dorset. The Church of the Holy Trinity at Swyre has an unusual ceiling - it is plaster with blue rib vaulting above the nave and there is a barrel roof over the chancel. 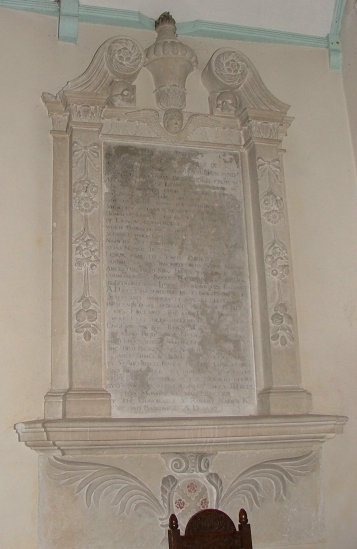 The text reads: IN MEMORY OF JAMES NAPIER GENT BROTHER OF Sir ARCHIBALD NAPIER OF MARCHISTON AND ROSTY K WHO WAS DESCENDED FROM Ye ANCIENT FAMILY OF LENOX IN SCOTLAND ....... EARLS CHANGED THEIR NAME OF LENOX TO NAPIER AT THE COMMAND OF ..... KIND OF SCOTS UPON THE ACCOUNT OF VICTORY OBTAINED AGAINST HIS ENEMIES. DONALD THE 2ND SON OF THE THEN EARL OF LENOX COMMAND ....... WHICH DONALD WAS THEN ........ SERVANT WHO GAVE THE LANDS W.... NAPIERS YET ENJOY BY THE NAME OF LENOX ALIAS NAPIER IN TIME ..... LENOX FELL TO TWO DAUGHTERS THE YOUNGEST WAS MARRIED UNTO ALLEN STEWART ANCESTOR UNTO KING JAMES THE FIRST & WHO COMMANDED SIR ROBERT NAPIER OF LUTON HOW IN BEDFORDSHIRE [UPON CREATING HIM BARONET AD 1612] TO SEND FOR HIS PEDIGREE .... OF SCOTLAND WHEREBY IT APPEARS THAT ARE DESCENDED AS AFORSAID ALL THE NAPIERS OF ENGLAND. 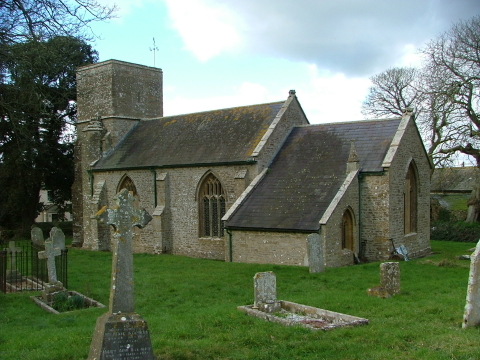 THE SAID JAMES NAPIER WHO LYES HERE INTERRED CAME INTO ENGLAND IN THE REIGN OF HENRY THE 7TH SETTLED HERE AND SUPPLIED THE SEVERAL ADJACENT ABBIES WITH FISH AND WHICH ARE DESCENDED THE NAPIERS OF DORSET AND SOMERSET AL. THIS IS ATTESTED BY Sir ARCHIBALD NAPIER K. PRIV. COUNSELOR AND TREASORER TO OUR KING JAMES THE FIRST AND RECORDED IN THE HERALDS OFFICE BY Sir WILLIAM SEGAR GARTER 1st SEPT AD 1625. Clearly, like other members of his family before him, Sir Robert went to considerable lengths to establish his family connections back to Scotland and was even anxious to build a family link into the Royal Stuart line. This is significant in 1692 - only five years after James II's departure, and only one year after his defeat at the Battle of the Boyne on 1st July 1691. However, it is consistent with the Dorset Napier family political alignments of the previous 100 years when many members of the family stood for, and paid out considerable sums in support of the royalist cause. Perhaps this apparent stubborn consistency (i.e. 'backing the wrong horse' - which some of them are reported have done literally, and thus lost all!) may go some way to explain the surprisingly quick disappearance of most of Napier 'squires' in area over the first half of the 18th century. This assertion of descendancy from a James Napier of Swyre can be found repeated by various subsequent writers without question. However, Charlie Napier http://www.napier.ac.uk/depts/clan_napier/ has done a considerable amount of research in the Napier clan and he can find no record of a 'James' Napier. He concludes that it was John Napier, the eldest son of Archibald Napier, 4th Laird of Merchiston and his 2nd wife "who arrived in the village of Swyre in Dorset in about 1500". John (alias James), may have first operated from Bexington just down the Road and established himself at 'Baglake' which is a few miles inland at Litton Cheney. 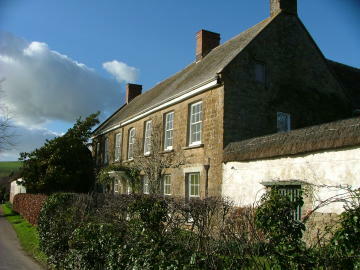 The exact location of his Baglake home is not certain but the name is preserved in Baglake Farm where there is now a fine C17th farmhouse - parts of which may have been built on the site of the original Napier house. by William Light in 1719.